The biggest crane I have seen in recent times. 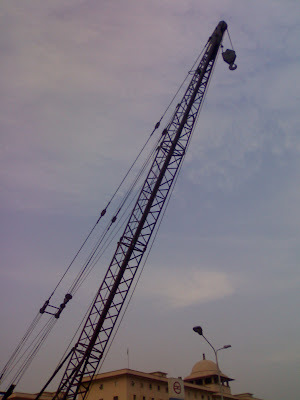 The massive machine is being used in the construction of Gurgaon Metro line. It just made me wonder about the relativity. The building in the backdrop is Krishi Bhawan. As a child I always thought that the building was huge. As I grew vertically, the building just seemed to shrink. And today the crane made it look minuscule. Hmmm... something to think about. Jus saw your blog couldn't resist commenting. Liked the Poster and Relatively high pic.